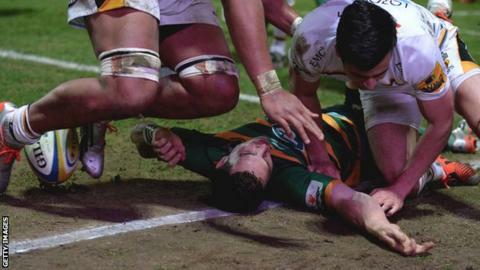 Wales and Northampton wing George North says he is "symptom-free" as he recovers from concussion. The 23-year-old suffered a fourth head injury in five months while playing for Saints against Wasps in March and has not played since on medical advice. Wales coach Warren Gatland has said he is "hugely worried" about North taking another blow to the head this season. "It's looking positive. I am symptom-free at the moment," North told The Daily Telegraph. As well as Gatland's worry for the well-being of the British and Irish Lion, who has scored 22 tries in 49 Tests for Wales, the coach has admitted a "selfish" concern that North is fit and available for the 2015 World Cup. Should North return to playing before the end of the season and suffer another concussion, the medical advice on his next period of recovery would likely see the wing sidelined for six months or more. Wales will name an extended training squad of 40 in early June, which will attend training camps in Switzerland and Doha during July. Wales wing George North could be in line to face Scotland on Sunday. There are warm-up games arranged for 8 August against Ireland, another against the Six Nations champions on 28 August, then against Italy on 5 September before Wales begin their World Cup campaign against Uruguay on 20 September. There is the possibility that North could play some part in Northampton's end of season, with Saints guaranteed a place in the Aviva Premiership semi-final play-off. But while the former Scarlet admits he would love to get back on the pitch soon, he is realistic that he is at the mercy of his own body and the medical checks he is still undergoing. "This is my time of the year, isn't it?" North added. "When you dig in through pre-season and then through the winter months of December and January, you want to get to when the weather is better, the pitches quicker and you want to be able to play some good rugby. "Obviously, again, I have got to take my time with this and get it right." North was first concussed playing for Wales against New Zealand in the 2014 November Tests, and was then struck twice on the head while playing against England during the Six Nations. Wales' coaching staff were criticised when North remained on the pitch against England despite his two blows to the head, but the incident and the publicity surrounding it has led to improvements in the assessment procedure. Since the England game the WRU has added extra resources at games to watch for incidents where players are at risk of suffering a concussion. In a separate interview with BT Sport, North said he has begun light training but admitted there are still some days when he feels "terrible". "To begin with it was assessment every day, because they like to monitor you for the first 24-48 hours. You can't really be left alone in case something happens," North said. "I saw a specialist and it was recommended that I take a month off and then review post the time off. "In that time I was able to do a little bit [of training] just to keep me ticking over - and then some days not being able to do much. "Then it's just how you progress each day and hopefully make a return soon. "A lot of it is how you feel on the day. Some days you feel terrible so you don't really do so much and then some days you're able to start doing a bit of biking. "That's what I've been able to do recently, just start doing a little bit of training to help me so I get back on the full training."